UPDATE: On April 22, 2013, Operation Ebook Drop was discontinued. My thanks to Ed Patterson for managing this great initiative, and thanks also to the thousands of Smashwords authors who participated. This post will remain for historical purposes only, and may inspire others to do similar non-profit volunteer efforts. The other day on the Amazon Kindle message boards, Smashwords author Ed Patterson met a U.S. soldier stationed in Iraq who wanted to download ebooks for his Kindle, yet Whispernet (Amazon's wireless download service) didn't work in Iraq. Ed offered to email the soldier all 13 of his ebooks, for free. The soldier gratefully accepted. Following the chance encounter with the soldier, Ed, himself an Army veteran, queried other indie authors on the Kindleboards message boards, asking if they too would be willing to offer their ebooks for free to troops deployed overseas. In a matter of days, about twenty authors volunteered their books. Almost immediately, Ed began receiving additional requests for ebooks from soldiers and their families. Ed and some of the authors started using Smashwords as the platform for distributing the ebooks to soldiers. Using the Smashwords Coupon Generator feature, authors are emailing 100%-off coupons to the soldiers. I stumbled across the thread at Kindleboards yesterday, and was pleased to learn about Ed's project and see so many Smashwords authors participating. I immediately decided I wanted to get Smashwords more involved. 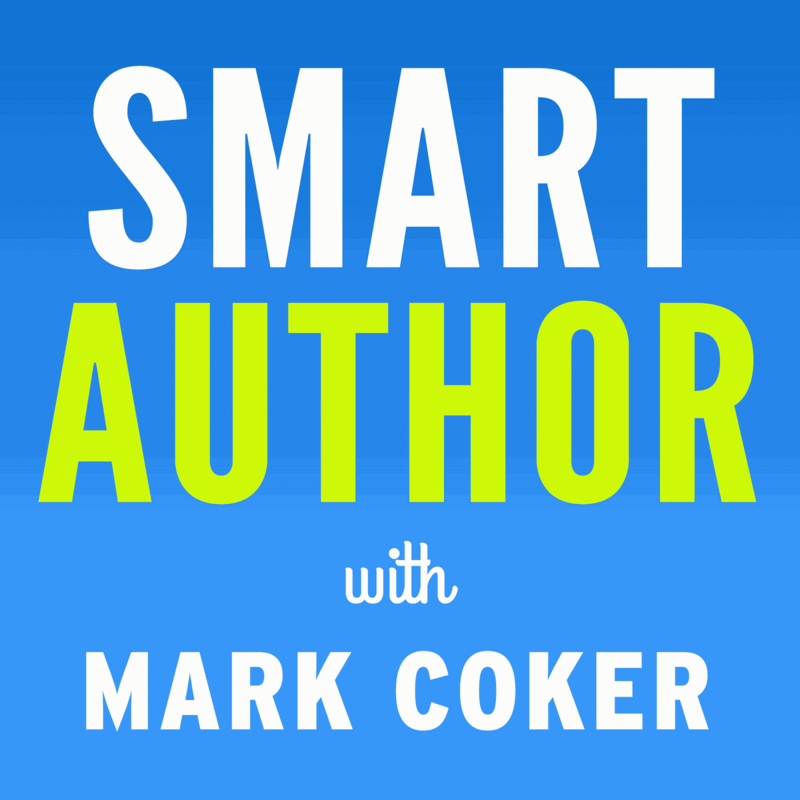 I got on the phone with Bill Kendrick, Smashwords' CTO (and chief magician), and together we brainstormed how we could help take Ed's campaign to the next level. Then late last night, Ed and I spoke on the phone for more brainstorming. 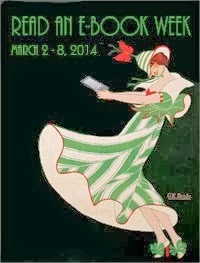 What began as "Operation Kindle Ebook Drop" has now morphed into something much bigger - "Operation Ebook Drop," in recognition of the multiple ebook-reading devices - cell phones, Kindles, Sony Readers, laptops, etc. - people use to read ebooks. 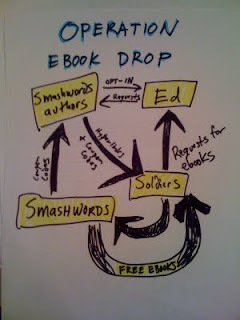 With Ed's encouragement, over the next week or so, we'll begin notifying our 1,300+ Smashwords authors and publishers about the opportunity to participate in Operation Ebook Drop. The campaign, as we kick it off today, will roll out in stages. For stage one, we'll encourage Smashwords authors to email Ed to opt-in to participate. On a regular basis, as Ed receives requests from deployed soldiers, he'll pass these requests on to the authors, who will directly email the soldiers hyperlinks to their book pages at Smashwords, along with Smashwords coupons which the troops can redeem to download the book in multiple formats, readable on any e-reading device. For stage two, we'll look to create a more automated system of matching soldiers with ebooks, so that rather than the manual process described above, we'll create a catalog, either hosted at Smashwords or by the military, where service members can access the books. The biggest challenge we'll face is authentication, but we think this can be achieved with some simple hyperlinks originating from within secure websites and intranets operated by the military. Ed has already started reaching out to different military branches to explore opportunities for collaboration on this important project. Authors and Publishers - Operation Ebook Drop has been discontinued. Here's how author's created coupons: To create a 100%-off coupon, log in to your Smashwords account and click on the Coupon Manager link. Ed will email you book requests, and then you simply email the soldier a hyperlink to your book page, and the corresponding coupon code. From your Dashboard, coupon redemptions will show up in your Sales & Payment History Report, and you'll also receive instant email notification. If you're not yet a publisher with Smashwords (why not? ), you can learn how publish with us by visiting our How to Publish with Smashwords page. Deployed troops - Operation Ebook Drop has been discontinued. Here's how service members created redeemed coupons: All coalition military personnel deployed overseas who need multi-format ebooks are eligible. According to Ed, "If you're overseas and away from your home and loved ones, your dependence on reading might increase - and so we a gifting you ebooks for Kindle, Sony, iPhone, Blackberry etc." For free ebooks, please email Ed at the address above. Please note that the ebooks you receive may be shared with fellow deployed service members, but may not be distributed or shared elsewhere. Please also consider the coupon codes you receive as privileged information, not to be shared elsewhere. The participating authors are pleased to offer you their books. Operation Ebook Drop has been discontinued. The unofficial staging area for Operation Ebook Drop campaign is over at the Kindleboards message boards. Check it out, help out, and support the young men and women in uniform with some great reads! Operation Ebook Drop also has its own web site, here. October 15, 2009 Update: Ed Patterson and I were interviewed at PodioRacket tonight with an update on Operation eBook Drop. Listen to the interview here. October 31, 2010 Update: Ed Patterson informs me over 500 indie authors are now participating in Operation Ebook Drop. Awesome! Congrats to all. April 22, 2013 Update: Ed Patterson informs me that Operation Ebook Drop has been discontinued. Ever since the pull-out of troops from Iraq, and now the wind-down in Afghanistan, the need for the service has diminished. My thanks to Ed for his great volunteer effort, and thanks also to the thousands of Smashwords authors who supported this. Hi, it's a great blog. I've been participating with Ed for the last few days. It's great that you're expanding the program! I've been participating, too, and have already been able to send books to two soldiers - and I want more. More! Thanks for getting involved. This is outstanding. My husband would have loved something like this when he was deployed. This is a great idea. I'm in Australia and don't have any particular connections beyond shared interests, but I'll certainly get involved. This is such a fabulous idea. Kudos to you guys at Smashwords for allowing other formats to become available. This is just the push I need to get my newly self published book up on Smashwords and then opt-in to this program. Thank you Ed and Smashwords for doing this. I think this is a great idea but are you going to send ebooks to troops of all nationalities? or just the US troops or friends of the US? or to the nation troops of the various author nationalities you have on this site? or to any soldier? I know how much you (and Smashwords authors) are proud of the international angle of the publishing site. You have no country boundaries on publication. So I just wondered how that would work for this idea! From an English author, living in Australia, who is pro-America but also an international peace-keeping fan! Hi Joanna, yes, this goes beyond American forces. We categorized it above as "coalition forces," but it's really open to all international peacekeeping forces as well. Ed's intention here is to provide indie authors the opportunity to give back by honoring the sacrifice these men and women make, independent of nationality, and independent of whether or not he, I, the authors or anyone support these conflicts. I've just emailed Ed and signed up, what a grreat idea and kudos to you for it being for All Peacekeeping forces. I am proud and privileged to be a participating author in Operation Ebook Drop. I encourage my fellow authors to join in this worthy effort. 41 Authors have signed up for this initiative and over 1000 Ebook coupons have been dropped for the troops. I am very thankful for the participants here - but I'm agrredy son of gun, and want more. Our men & women in the Armed Drces are well worth the effort and giving free books is no great sacrifice compared to their lives on the line daily for our basic freedoms, including the freedom to write. Great news, Ed! I'm so happy and so proud to know that so many indie authors are taking part in this program. I was happy to sign up and offer all my books. It's only fitting, since a lot of it is sci-fi adventure with a military touch. Thank you for putting this together guys! Count me in! I'm going to Smashwords now to sign up! Wonderful and now to get the word out to everyone! First, thanks for forming Smashwords to begin with. Then thanks for getting involved in such a worthy cause. I just signed up and am looking forward to seeing my first download go out to one of the troops listed. I am totally happy with my decision to move over here to Smashwords. Thanks, Rebecca. Welcome to Smashwords! And a big shout out to all the indie authors who have checked in with Ed Patterson to sign up. Over 60 authors participating now. Just had a thread with one great person in Texas yesterday who is purchasing several Amazon Kindles out of his own pocket to pre-load with OED books to ship off to several units overseas. This was simple to do and within 20 minutes of sending my first emails to the troops I had 2 of them take advantage and accept my book. What a fantastic feeling. Thanks Ed and Mark. I even got a nice thank you note from an officer aboard ship for my participation. Thank you to everyone who is participating. What an incredible program! As the spouse of a recently retired soldier, it does my heart good to see this kind of support. As an indie author, I'm in! Wonderful idea. Thank you. I just ordered and received a Kindle for my son who is on his third tour "studying abroad." During his first tour, five years ago, he asked for books and our community rounded up and shipped 10,000 real books through http://anysoldier.com. I think they'll like receiving eBooks better. Toting 30-lb boxes is not fun. I work with a new eBook publisher, http://publishing.kolbnetworks.com, and I've added our authors' books and many 99-cent classics before sending it overseas. When I ship it, I'll include Ed's email addy. Thank you so much for doing this. I appreciate the opportunity to do even a small part to ease the stress of our deployed military personnel. You and Ed have done a wonderful thing. This is a brilliant idea. Count me in. Also, if you need help coordinating PR and contributions from the UK, I offer my assistance. I am an ex-military officer (with 20-years service, including NATO) and I have some useful press contacts on this side of the Atlantic. Hey David, awesome. Thanks for your offer of assistance to help spread the word. Why don't you contact Ed at the email address in this post and he can help you coordinate. Thanks! I have emailed Ed. Feel free to let him know it is on its way to his in-box! Let's see if we can keep up this great momentum! This is a great idea. I just wished I could participate. All my ebooks are free to everyone, but since I'm not a SmashWords author, I'm not eligible to donate here. Hi Donald, you don't need to be a Smashwords author to participate. Contact Ed and he can add you to the list. Thanks. What a great program - I'm so happy to have my husband's books be a part of this! I'm on my way to smashwords right now to sign up my book! What a wonderful idea. Is this something that Paradigm could champion/support as part of the Welcome offering from the UK. Simonc @Paradigm. Please give me a shout through UK blog site http://oebduk.blogspot.com/you can find my contact details there. As a proud third generation military vet (USAF) and Smashwords author, I think this is a great idea and will sign up! Great recon of the boards to make this idea go global. Haha.. the only thing stopping me from jumping on board with this is that my stories involve military, and although it's a military in the 'near future' in a country that I made up, I suspect that REAL soldiers would find SO many flaws in how I 'operate my military'. Joseph, I felt the same way, though my military scenes take place in BCE times, I'm still intimidated to let a real military person read it. But I did, and so far two of them have ordered it. Gulp! I guess it's worth a shot.. I mean.. at worst, they hate it, and ask for a $0 refund, right? Exactly, Joseph. At least give them the chance to love your book. I sent some books with my son when he left for Kandahar. He lent out a copy and had everyone autograph it, then gave it back to me at his wedding in April. What a treasure. My son is deploying to Iraq in March and I was thinking about getting him a Kindle or some other digital reader for Christmas. My sister mentioned how difficult it was to download books while overseas and suggested I first research it. What a wonderful, worthwhile endeavor for our troops! Thank you and I'll definitely have my son let his fellow soldiers know about this program. ps I haven't yet decided what to get him, but am leaning towards a Kindle. Just signed up all mt titles. We're honored to feature Operation E-Book Drop as our Starry Night Creative Artists Community Winter 2010 Showcase. Operation E-Book Drop will be our featured showcase until April 2010. Scroll down to "Showcase" link. Great idea. I hope this spreads across all nations troops. I was wondering if the free Ebooks was still available for those who are deployed. My brother left for Afghanistan last Wednesday and got himself a Kindle before he left and I would love for him to have access if you are still doing this. Thanks! Yes, we are still sending books. Email Ed at the address above and the word will get to your brother about all the free books he can download! I am very excited to be a part of this incredible program with my mystery/romantic suspense novel, NO EASY WAY! Thanks Ed and Happy Holidays! Have my two ebooks out there for Ed to hand out as well. Wish i would have had something like this when i was in Iraq all those years! Hello I'm Bill See, author of "33 Days: Touring In A Van. Sleeping On Floors. Chasing A Dream." Operation ebook Drop is a great program and I'm honored to be a part of t.
Shifter Evolutions has had some soldiers contact me directly, and so I think this program will bring it to many more! Fantastic idea. I have made my novel Stags! available. My thanks to Edward Patterson and Smashwords for helping to bring this together. Our soldiers deserve more than we can ever give. My husband is a Vietnan Vet and both our sons are Vets of the Desert Storm Gulf War. I think this is an awesome idea! My oldest son did a tour in Kuwait and I know there were restrictions on what kind of books could be sent to him. This will not only allow them availability but also a larger variety. I'm in! I have a suggestion . . . What about free books to the VA hospitals around the US? My son is a Purple Heart recipient and I have thought about trying to volunteer at one of the VA hospitals. Sadly, I am so far away from any of them to be able to go. Free books at the VA hospitals would be ideal, since a lot of the soldiers are confined to their rooms if not in therapy. This would make me feel as if I helped in a small way, if they had access to my book for free! Any comments? dropped you an email offering all my work which is already free anyway. ex-forces myself so happy to be able to help any comrades in arms. Will be emailing you shortly. I have no problems giving out any of my books for free. Great way to get their minds off of things wherever they're stationed! What a wonderful idea! I love it. I just wish I had more books to offer. Opt out any time. No spam. Private list. Never miss another post. 2018 Book Industry Predictions: Are Indie Authors Losing their Independence? Is Kindle Unlimited Bad for Authors? Founder of Smashwords, an ebook distributor.